It fell to me to arrange and host the two days of lectures for the 2017 conference of the National Association of Mining History Organisations (NAMHO), while other members of the hosting group, the Wealden Cave and Mine Society, worried about pig-roasts, field trips, beer and the Saturday evening’s live band. The conference was held over the weekend of 24th and 25th June. Being lecture coordinator gave me the opportunity to compose a review of the lectures element of the weekend, and to demonstrate that, just as in the world of natural cave studies, mine exploration involves more than simply getting wet, muddy and tired. The sedentary element of the conference weekend took place in the White Hart Barn, the village hall in Godstone, Surrey. As there is a barrier of at least two major conurbations (Birmingham and London) between a great many mine enthusiasts and Surrey, we were not expecting to be overwhelmed by a large number of conference delegates, so a simple programme of 13 lectures over two days was put together. The remote location of Surrey has hosted this conference before in 2005, and we knew from this earlier event that is was unrealistic to expect a great many delegates. But of course, it isn’t quantity that counts, its quality, and all our speakers lived up to this maxim. The theme was Mining History Groups – Achievements and Challenges. The aim was to encourage NAMHO member groups to showcase some project they thought would best illustrate to others how they have achieved something important, and the challenges they had to overcome on the way. This also gave the speakers a great degree of freedom to speak on just about anything! Tracy Elliot of the Trevithick Society was our first speaker. She presented a history of the society, and especially on recent achievements such as the work with the National Trust at the Levant Mine engine on Skip Shaft, and the construction of a working replica of Trevithick’s first steam road locomotive. 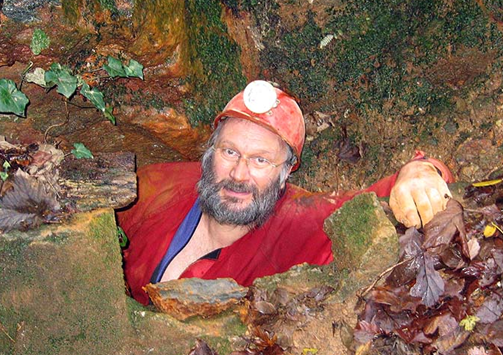 Peter Burgess then followed this with a history of the development by Wealden Cave and Mine Society of the Reigate Caves from a derelict state into a local visitor attraction, a project that continues today. 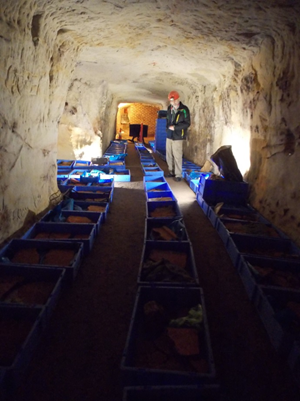 Working with the local authority which owns the caves, statutory bodies and other third party users of the caves (old sand mines and abandoned storage cellars) was the main thrust of the presentation, alongside the physical changes and improvements that have been undertaken. Paul Sowan, although diverting somewhat from the theme of the conference, gave a very welcome presentation on the nature of the Surrey hearthstone trade, which in mining terms was very significant in the nineteenth and first half of twentieth centuries. To have a mining history conference based in Surrey and not to have included something on hearthstone mining would have been a serious omission! The first lecture on Saturday afternoon was from Jon Barker of the National Trust, who was the prime mover in the restoration of the Fan Bay Deep Shelter near Dover. 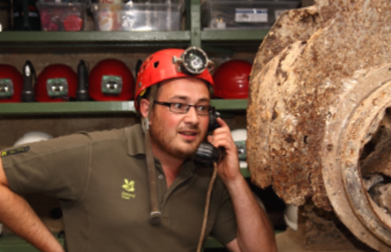 He spoke in his role as Visitor Experience Manager for the White Cliffs of Dover. This set of tunnels dug into the cliffs dates from the Second World War and served one of several long-range gun batteries in the area, protecting access to the English Channel. 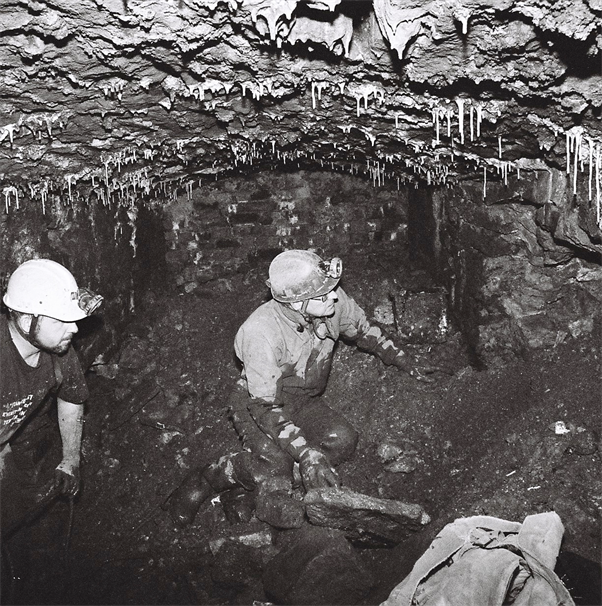 The means by which the restoration took place involved a large degree of volunteer labour, largely from the Kent Underground Research Group (of which Jon is a member), and is a showcase of how such voluntary projects can work, and result in a well-presented and managed visitor site, of national significance. Being located within a SSSI presented more challenges, but as the project essentially improved the chalk grassland immediately around the shelter, this was an easy issue to deal with. Jon Maisey followed with a comprehensive narrative of the exploration and research of a set of quarry workings south of Windrush village in Gloucestershire. Jon described how with just a few volunteers, and with the blessing of the landowner, they have probably rediscovered much of the workings here, and undertaken research to locate and identify many of the names that have been written on the walls. This was considered a reasonably urgent project while the quarry inevitably deteriorates and sections of it become sealed or too dangerous to enter. An underground stables has been identified, which had been referred to in local stories about the old quarry. Haulage features in the form of deep sinuous grooves on pillars have been identified as being caused by the passage of teams of horses, the grooves being cut by the ends of swingletrees, the horizontal pole that forms part of a horse’s haulage tackle, and which is found immediately behind the rear of the animal, and to which the traces are fixed and which transfers the load of the cart to the harness and collar. Similar features are found elsewhere in traditional dimension stone quarry workings and this is a good example of how research in one region can often benefit work elsewhere. Encourage new officers and consider changing the constitution to permit ordinary members of member organisations to be eligible for officer roles. Consult member organisations on what they would like NAMHO to focus on. Increase subscriptions, as they have remained unchanged for a long time. Facilitate regional forums to liaise with other organisations and statutory bodies. From the discussion came an interesting idea, that we should all be encouraged to consult our local Heritage Environment Records, and provide corrections or additions to them where we find omissions or mistakes in entries relating to mining and quarrying sites. Another full day of lectures followed on Sunday. Hamish Orr-Ewing started the day by telling us the story of restoration and conservation work at Brandy Bottom Colliery, north east of Bristol. This is an important Scheduled Ancient Monument, being one of the best examples of a surviving set of nineteenth century colliery structures. Being located adjacent to a popular cycle route, along the old railway that served the mine, it is reasonably well visited location now, although it was once considered a remote spot. 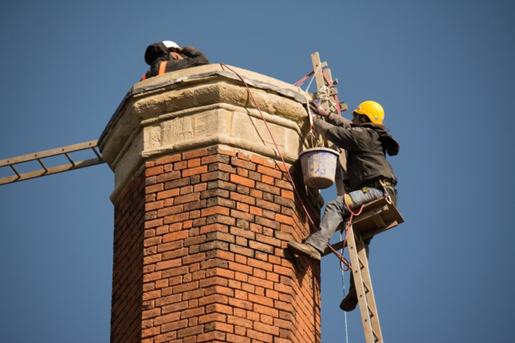 The means by which the tall stack was conserved involved installing an aluminium ladder within the flue, which was far cheaper than the alternative of erecting a scaffold frame. It also provides a permanent means to allow future inspections. The other surviving mine structures have been stabilised and conserved after full consultation with Historic England. A long egg-ended boiler has been purchased which is the correct length to install within the surviving boiler foundations, adjacent to the Cornish engine house remains. Paul Thorne, well-known by many for his entrance security work, and other ingenious constructions related to mine exploration, was the next speaker. 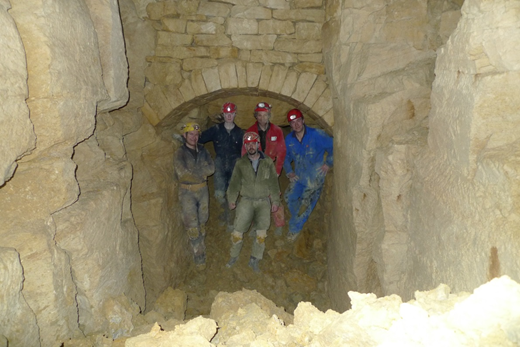 He described a project from a few years ago, which comprised a thorough investigation of a late 18th century limestone mine in the Burwash area of East Sussex. The limestones of the Purbeck inlier in the Battle area were exploited for lime-production, and those on the Ashburnham Estate are very well documented. Shafts were sunk down to intercept the beds of “grey” and “blue” limestones, and drainage levels kept the mines dry. At the spot on Kingsdown Farm selected by the Kent Underground Research Group, there was a suspected sough draining the workings into the nearby River Dudwell. This was evident as an obvious spring in the bank of the river but was clearly completely collapsed and not capable of being re-opened. The original shaft location where the workings were to be investigated was on the shallow hillside to the south of the spring, and as luck would have it, the team excavated a new shaft exactly on the line of the old shaft, not only of the same dimensions, 3ft by 4ft, but at the precise orientation as well. This meant that as the new shaft progressed downwards, they gradually discovered more and more of the original timber lining materials, and at depth found it to be very well preserved even though it was at least 200 years old. The timbers were probably from local oak trees. 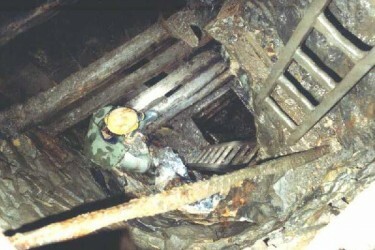 Several problems were overcome during the dig, including power to hoist the spoil buckets, a means to provide safe steel scaffold framework for the lining, ventilation, and finally pumping. The shaft was of sufficient depth (40 ft) that it was necessary to pump the water using a staged combination of petrol powered and electric submersible pumps, but this proved inadequate, and finally a 4 inch pump, 8 kW, 400V 3 phase mains pump was hired for a weekend. This removed a cubic metre of water per minute, and allowed a further ten feet of the shaft to be dug out, albeit in exceptionally wet conditions, and this exposed timbers in good enough condition that no further steel lining was considered necessary. It also allowed the mine level to be inspected, as long as the pump continued to work, as the entire base of the shaft would fill up within 5 minutes once the pump was switched off. The level had collapsed a short way in either direction, but enough of the original lining was visible to see how the level was supported and laid out. Paul gave a very lively and fascinating insight into a little-known aspect of mining, and one that is barely recognised in the locality, never mind at a national level. John Smiles, another KURG and Sub Brit member, then spoke about his project to conserve and improve the abandoned radar station bunker from the 1950s at Wartling near Pevensey, known as Wartling ZUN. This abandoned bunker had suffered from a serious ingress of water and this presented quite a challenge to the team of volunteers. The cause was the way in which the RAF had decommissioned the site, by demolishing many of the surface structures which allowed water to enter via cable and other service ducts. Apart from a major pumping exercise, using stages, the long term answer was to expose part of the top of the bunker, which is in effect a huge concrete box, and seal the leaking points from the outside. This also allowed ventilation ducts to be added which helps keep the site dry. One concern was that discharging a huge volume of water into the Pevensey Levels would upset Natural England, but the water itself proved not to be seriously contaminated and doing the pumping in the summer was a bonus as it raised the water in the levels beneficially. The long term plan is to make the bunker reasonably safe for visitors, and not to restore, but to leave the site as it is. Work is concentrated on research into the history of the bunker, recovery of artefacts which were removed by others for safe-keeping, keeping the site free of water, and maintaining the basic infrastructure such as stairs and walkways. 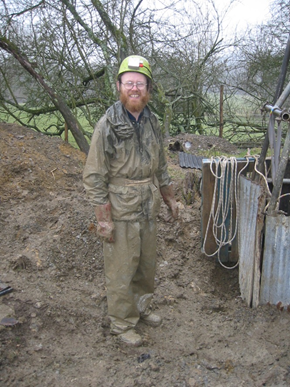 Entitled Working Across Boundaries, Peter Claughton’s presentation sought to demonstrate how it was necessary to bring together the work and knowledge of mining history groups from many areas to produce a coherent framework document for the Archaeology of the Extractive Industries in England, in conjunction with Historic England. Without this work, it would not be possible to move forward to produce a research strategy, prioritising those areas of mining archaeology that are most important. The first two phases of the Research Framework were published last year as The Archaeology of Mining and Quarrying in England – available as a free PDF download. 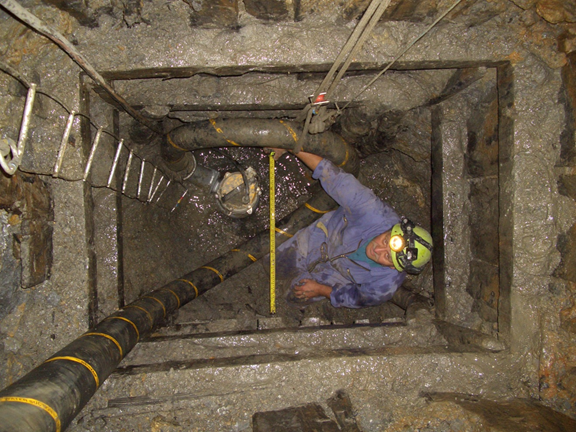 The story of the excavation of the Serridge Pumping Engine in proved to be a good example of how working with third parties provided a number of challenges to the South Gloucestershire Mines Research Group. Dave Hardwicke described the story of their investigations in detail. Working on the site of a coal mine required regular consultation with the Coal Authority over whether permission was required to undertake work. By and large, this turned out not to be an issue, but interpreting whether the tunnels being investigated were coal mines or just tunnels meant regular consultations with the Coal Authority. Three further considerations provided more challenges for the group. First, relationships with the neighbour were quite delicate at times, there were discussions with the local authority over whether planning consent would be required for the work (it wasn’t), and the matter of insurance was also an issue. This archaeological work was often considered out of scope of the group’s third party liability cover, as it was often being done underground, albeit in shallow tunnels. 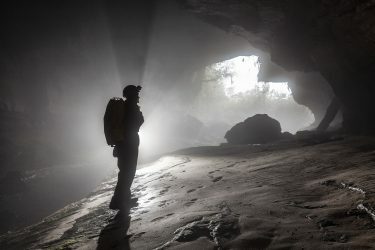 Whereas the group itself is not insured by its members being BCA members, so it is fortunate that many of the group are also members of the Hades Caving Club, or other clubs, which allows the BCA’s liability cover to apply. 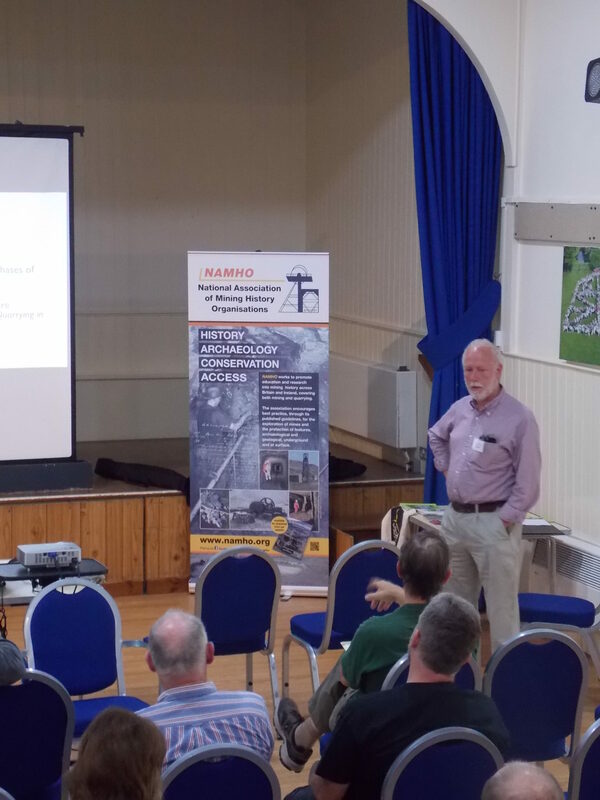 Richard Shaw, is a recently retired principal scientist with the British Geological Survey and presented a few recent projects within that organisation of interest to mine historians. First he described the Mining Hazards Project, which comprises three elements. 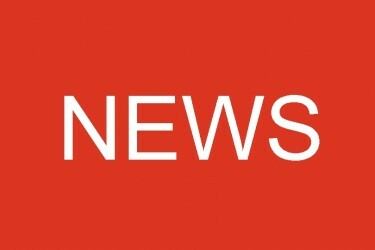 There is an ongoing scheme to digitise mine plans, of which there are a great number not covered by the statutory requirements of mining legislation. These have been variously deposited with county and regional record offices, obtained from the Coal Authority, or are in private or company collections. There is also a compilation of indexes to mine workings, and from these there follows the compilation of mining hazard maps. Aside from this major work, Richard also mentioned investigations in the underground Corsham Bathstone quarry, geological work in Carrock Tungsten Mine, mine water levels in Frongoch Mine, and research into the exceptionally fast-growing speleothems in an abandoned railway tunnel in Derbyshire. Our final scheduled speaker was Hugh Carson of the Ecton Mines Educational Trust. Hugh first described the work of the trust and the nature of the mine workings entrusted to them. He then described an EU-funded project to develop autonomous submersible drones, that it is planned will be capable of descending deep flooded workings to record mining features and the mineral content therein. 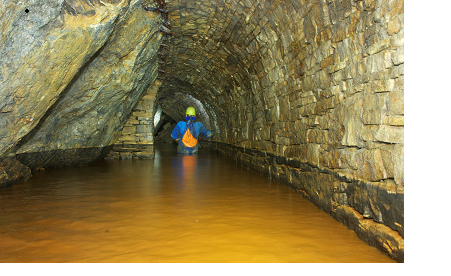 Restoration work of part of the Ecton Mines dressing floors was also described. The meeting was also happy to welcome Tony Brewis who had offered a short presentation on the story of copper, which was an informative and interesting way to finish the conference. First he ran through the nature of various copper deposits and minerals, and gave an overview of how they were formed and where they can be found. Tony, with a long career in the industry, was able to show the various copper mines around the world, their development and possible future. And thus the 2017 conference came to a nice conclusion, and in 2018, we will reconvene in the Forest of Dean. Finally, a brief comment about the venue. The White Hart Barn proved more than adequate for the conference, with very convenient facilities, a good kitchen, comfortable seating, an excellent stage and screen, and set in a quiet neighbourhood. My thanks go to fellow WCMS members Mary Albury and Jenny Watts for taking on board the catering for both days, with an ample supply of food and refreshments, and helping with setting up the hall and clearing up afterwards.